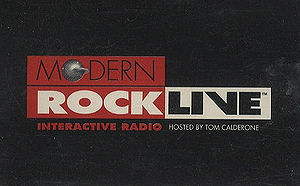 On 16 August, 1997, Morrissey and his band appeared on the nationally syndicated show Modern Rock Live hosted by Tom Calderone. Five songs were performed and broadcast. Morrissey was interviewed by the host Tom Calderone (transcript at No Dad, I Won't Be Home Tomorrow). A lossless version of this performance is available at Smiths Torrents. MP3 versions are available at the usual places. This page was last modified on 5 January 2013, at 10:44.